On a beautiful weekend in July (July 23-25, 2010 to be exact) many of Andrew’s closest family, friends, and military friends made the trek to Alexis Creek along the Chilcotin River, a little more than 100 km West of Williams Lake. The destination was the Nuttall’s ranch, where Andrew, his brother, and his father had spent only a few memorable times together since Richard had bought the place a few years ago. It is a place that’s rugged and beautiful, and both Andrew and John understood and enjoyed in the same way their father had when he decided to purchase it. In the memorable times they spent there they had discussed plans for the future of naming the ranch, putting a header with a sign to welcome visitors, and eventually building a cabin so that they could return regularly and spend quality time together in the years to come. On this weekend, though, we were all there to remember and honour Andrew. We did this by meeting each other if we hadn’t met before, reminiscing about our relationships with Drew, hearing about the varying and different experiences we had all had with him, and helping do what turned out to be one of his last requests to his Dad in their final phone call: to finally put up the sign that identified the ranch. So on Saturday that’s exactly what we did. A few people - including members of Andrew’s platoon, fellow officers, Andrew’s father, brother, and aunt, among others - spoke to help us remember Andrew fondly and mark the occasion. 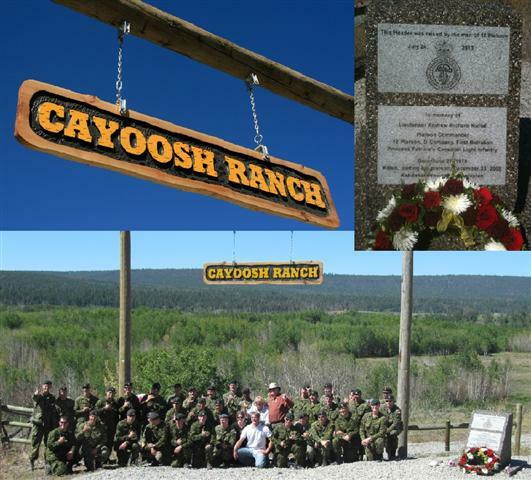 With the header already raised, we watched as two members of Andrew’s platoon attached the sign bearing the name “Cayoosh Ranch”; Cayoosh is a Native term that apparently refers to a strong Indian mountain horse, and the Chief of the Native reserve that is next door to the ranch claimed that it was an appropriate name for Andrew, and that his people related to the loss as they are a warrior nation themselves and have also lost many in their storied history. Finally, a granite monument memorial to Andrew was unveiled. This monument will be there long after any of us, and will keep Andrew’s memory alive even beyond our own vivid memories of him. We all stayed as long as we could in the heat to keep the moment alive as long as possible, and then slowly dispersed back to the neighbour’s place where the platoon was camped out and family and friends were staying in and around the cabin. The Nuttalls gave out medallions commemerating the occasion and a few other stories and more private presentations happened just before lunch. That afternoon, and later into the night, the party went on, and we all got to know each other better by sharing a few beers and stories, and even doing a group beer shotgun (or maybe more than one) in Andrew’s honour. The following day the platoon went into Williams Lake where a group of locals had prepared lunch and a ceremony to show how much they appreciated what the boys had been doing overseas. It was a great weekend - one that Drew would have loved to attend himself, but I think we all knew he was somewhere watching and smiling at us, happy we were getting to know each other and remembering all of the good times we had shared with him.